As always the climb up 650 metres to Moonlight Flat is hard work. There is also the perception that you have reached the top when stepping up out of the forest to a heathy area only to discover there is another 15 minutes of climbing to go. Memory that Bullfrog Tarns is met just after the top are also knocked when it is another 500 metres further on before that well deserved break and water. The mud along the flat can mostly be avoided, but it becomes mighty hard to do so on the final approaches to Burn Creek. We did manage to get on a side pad that eventually ended but with scrub not hard to get through and by good luck did avoid the worst bits; not so on the return leg though. Just before the top of Hill One we wondered why the stepping stones were not appearing and when the pad we had been following petered out we realised that somehow we had missed a turn. I had a waypoint stored in the GPS so got it out and discovered we were only a few metres and a small cliff below the point. We weren't the only ones to go the wrong way because a plastic bag with a steak had been passed hanging in the scrub. We met the owner camped in the saddle between Hills One and Two a short time later. Moores Bridge was finally reached at 5PM after a 7 hour day. The important middle day for the walk to Mount Alexandra dawned still and cloudless, so our luck seemed to be in. Although some cloud developed during the day we were blessed with delightful walking conditions. Back in 1995 I discovered a cut track through the thick scrub but this time it took three attempts to discover the start, and then only because I pushed through the likeliest looking spot and found a sawn stump. We had to push through quite a bit of scrub, most noticeably Scoparia, for the 150 metres through to the open. In another 5-10 years my guess is that this will be completely overgrown. Once on the first high point of this 6 kilometre long plateau we could appreciate the delight of the place. It was pretty much covered with cushion plants for the whole distance ahead and in parts was over a kilometre wide. Wandering over this in pleasant, calm and mostly sunny weather was a privilege. 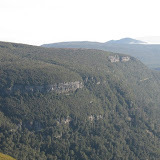 It was also a huge viewing platform as there was nothing to impede the views of the surrounding mountains, such as Bisdee, Victoria Cross, Wylly and strikingly beyond them Precipitous Bluff. And of course all the other peaks in whatever direction you looked. I had long wanted to go the Moores Garden as the name conjured up a picture of a natural garden. This probably made the expectation a bit more than the reality, but nevertheless it was a superb place and so huge. Even though mist rolled in as darkness arrived, bringing with it a brief light shower or two, the next morning was again clear and cloud free. The first part of the walk out was good and very scenic, but then we had to contend with the mud once back on the track, especially over Moonlight Flat. At about 2 PM, with some 90 minutes to the car, we met a couple going in with plans to camp at Pigsty Ponds; it would have been interesting to learn how they got on as our calculations had them getting there pretty late in the day.